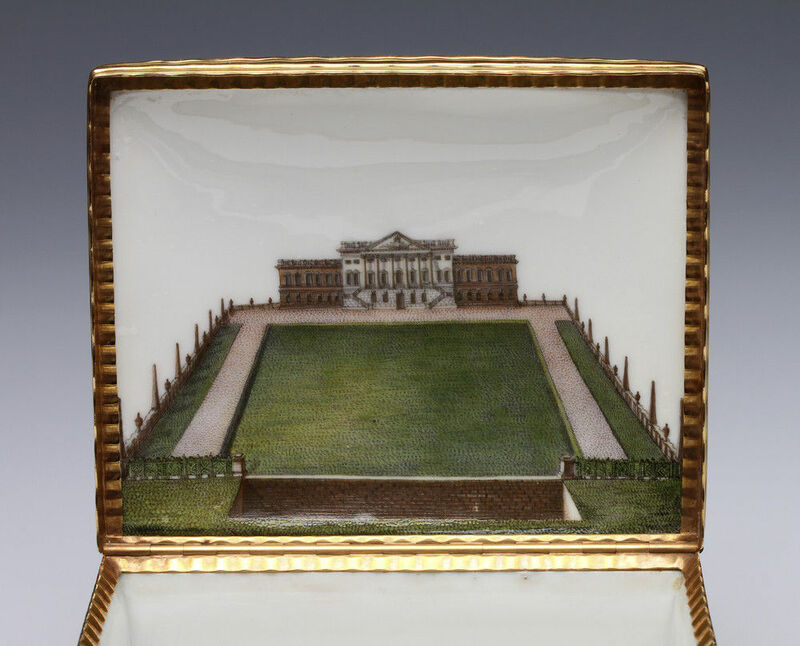 Slightly larger than a typical snuff box, the interior of the domed cover painted with a view of Wanstead House showing the entrance courtyard with its ha-ha and elaborate railings ornamented with urns and obelisks taken from an engraving. The exterior with bunches of deutsche blumen. The engraving is included in the copy of Colen Campbell’s Vitruvius Britannicus belonging to the Royal Academy. Wanstead House was considered the masterpiece of the Scottish architect Colen Campbell. It was commissioned by Sir Richard Child in 1715 in the emerging Palladian style on a scale to rival mansions such as Blenheim Palace. Campbell claimed that it had the first classical portico in England. It was completed in 1722. Sir Richard was created 1st Earl Tylney in 1731 and was succeed by his son the 2nd Earl in 1750. Apart from a few armorial services this is only the second piece of 18th century Meissen known with a specifically commissioned British scene. 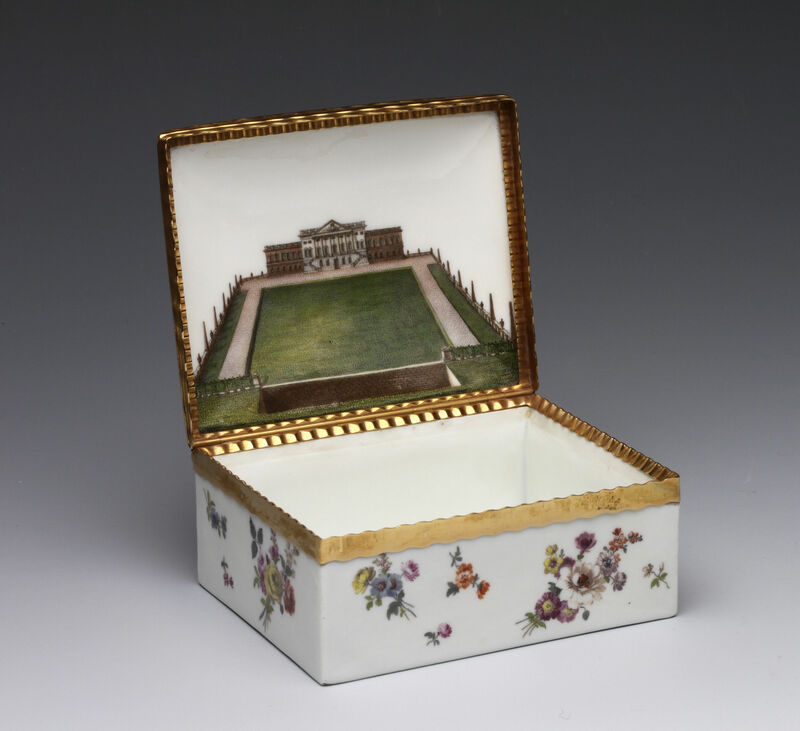 The other is a box in the collection of the Earl of March and Kinrara at Goodwood is painted with a portrait of Lady Caroline Fox, the daughter of the Duke of Richmond who eloped with the ambitious politician Henry Fox. 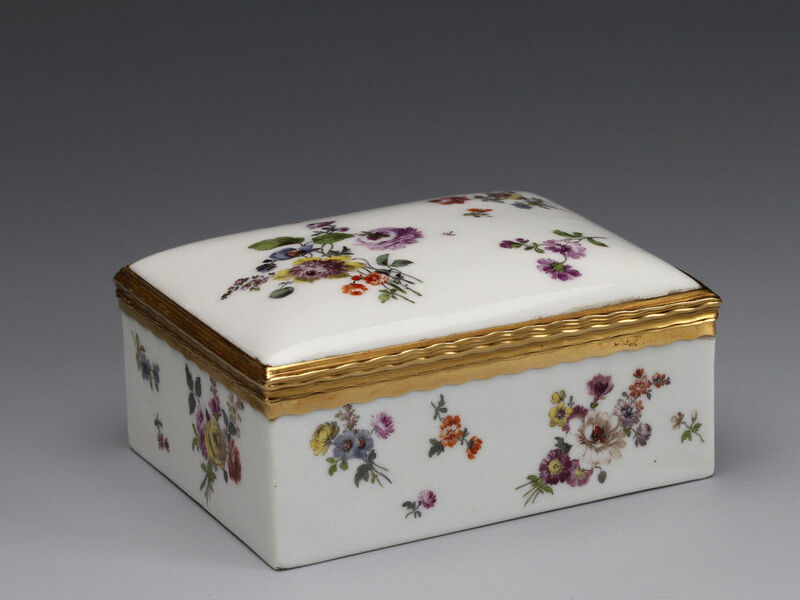 Lady Caroline was reconciled with her parents and Henry Fox commissioned three boxes (a table box, a man’s snuff box and a lady’s snuff box) through his friend Sir Charles Hanbury Williams, the British envoy to the court of Saxony, one survives which is presumably the man’s snuff box. John Tylney, the 2nd Earl Tylney, spent much of his life in Italy on the Grand Tour and died in Naples. It is not clear if he visited Dresden on his travels and commissioned the box there or whether he commissioned it through Hanbury Williams like Sir Henry Fox. The fortunes of the Tylney family waned and culminated in a spectacular bankruptcy and sale of the contents of the House in 1822 from June 10th to the 21st followed by further sales that year. 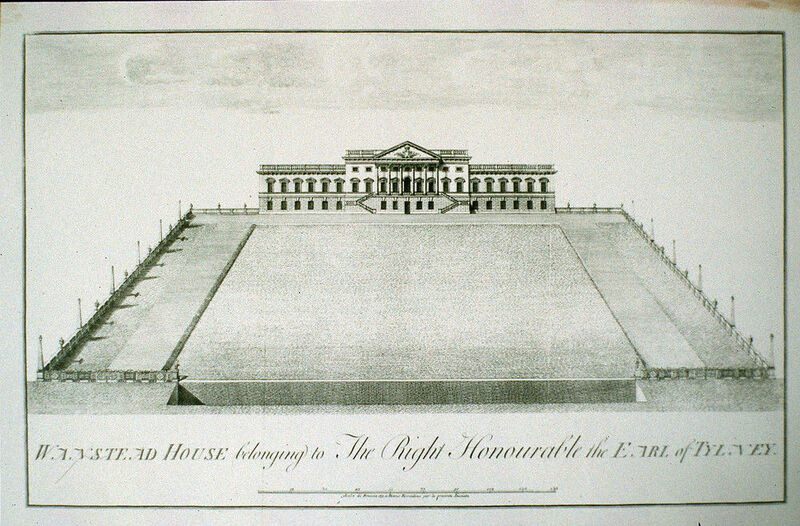 The house was demolished in 1822. The original gold mounts are chased with a wave pattern. I am grateful to Sally Jeffrey and John Harris for help with this entry. Literature – For the Lady Caroline Fox box see ‘The Treasure Houses of Britain: Five Hundred Years of Private Patronage and Art Collecting’, National Gallery of Art Washington, 1985, no. 396, p.461.